Kelly McGonigal is back with her second book of accessible psychology The Upside of Stress: Why Stress is Good for You, and How to Get Good at It. Much like her previous book, The Willpower Instinct, McGonigal processes a mountain of psychological research and presents it all in a readily accessible, practical format full of reflective prompts and mindset interventions. It worked last time with willpower and it works again with stress. The claim is bold: stress isn’t bad for you, it’s good for you. It’s a nice message, and fairly easy to comprehend; we learn from adversity and what doesn’t kill us makes is stronger, but it also deliberately flies in the face of our common perception of stress as dangerous and harmful. SO what’s the deal? Is stress good or bad? Well, McGonigal’s claim is that it depends on your mindset and how you perceive stressful stimuli in your life. You can get McGonigal’s basic premise through her TED talk “How to Make Stress Your Friend.” It’s a great introduction to the concept, but the book is required for any kind of depth. The TED Talk alone landed me in the category “of that sounds great, but come on… really? 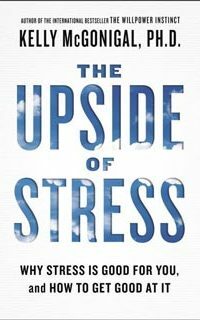 What about all this research about the dangers of stress?” Throughout the book, however, McGonigal continually builds up her claim with a veritable mountain of research. The core text of the book is 230 pages and there are an additional forty pages of end notes. Each claim is thoroughly supported through research, and it remains accessible and straightforward throughout as a skillful combination of literature review and personal stories. The primary claim in The Upside of Stress is essentially the same as Dumbledore’s above: what goes on in our head is just as real as that which goes on outside our head, or in the context of The Upside of Stress, by changing our relationship to something that is stressful we can reduce the negative impacts of that stressful event or task. Essentially, if you believe stress to be beneficial to you then a stressful component of our lives can change from being harmful to helpful. This is because, according to McGonigal, we experience stress when our values are in conflict. For example at work I may feel a conflict between responding to email thoughtfully and responding quickly to the volume of email that I receive. That clash of values creates stress. If I did not care about responding to my email, the volume of email I receive would not impact me at all. It would just exist. The stressful experience is due to my desire to communicate effectively. If the theory works, by repositioning the work to be done as a representation of our values, I can bring out the positive components of stress to improve my daily reality. I won’t reduce the stress experience, nor will I reduce the necessary work, but I well feel differently about the stress involved, and therefore the stress will impact me more positively. It’s disarmingly simple. It also works. At work I have a particularly mindless data entry task in which I have to record participation in an activity for each teacher in our district. There’s a paper form and the data entry is tedious. It’s classic, and unnecessary bureaucracy that would have been completely avoidable with a bit more planning. I’ve been frustrated that this data entry is taking away from what I view as my “real work” of planning and facilitating professional learning. From reading McGonigal’s book I tried to reframe the data entry work, not as a burden on my workload, but instead as an example of how I can help teachers receive additional pay for professional learning; something I believe in strongly. This shift in mindset, along with deliberately scheduling times to do the data entry, has completely changed my relationship to the work. No longer do I let the data entry tasks pile up and wear down my patience; continually distracting me from other tasks. Instead, I can be comfortable with a stack of forms to enter because I know I will get to them at the scheduled time, and in doing so I will help teachers receive additional compensation. The actual work and the volume of forms to enter have not changed, but my relationship to that work has changed dramatically. I don’t necessarily look forward to entering forms, but I no longer dread it and it occupies substantially less of my attention while I am not actively performing that specific task. In all honesty, this shift alone would make the book worth the cover price. I’m confident, though, that the book will continue to pay dividends in my life, much like The Willpower Instinct has. The Upside of Stress is a 240 page mindset intervention, and while it may be difficult to pinpoint precisely which parts of the book, or which reflection prompts have the most impact, I know that my relationship with stress is changing. I am intentionally looking for how a stressful reaction is related to my values. My relationship to my body’s physiological stress response is different as well. I am more likely now to consider an increased heart rate as a sign that my body is geared up to take on a challenging experience. This is incredibly empowering and it really does only take a change in my thought pattern. I don’t mean to imply that the shift is necessarily easy or quick though. Changing our mindset on anything is a challenge, and McGonigal herself admits that her mindset with regard to stress is still a work in progress despite the years spent working through the research. The Upside of Stress is not a silver bullet to fixing your life. The book will not make you stress free, but it is a powerful boost on your journey toward a new, more positive, relationship to stresses in your life. This is part ten of my willpower project tracking my progress through Kelly McGonigal’s The Willpower Instinct. Jump back to part one if you want to start at the beginning. This post will be focused on my reflections for Chapter Nine. Chapter Ten is a wrap-up, and I will include that material in my final post. I really like the material in Chapter Nine. It’s extremely accessible and immediately applicable. Understanding the limits of “I won’t” power has made a noticeable impact on how I process issues of self restraint, even in just a few days. Also, unlike some of the other chapters, the experiments were very straightforward in terms of implementation and did not require specialized conditions. Unintentionally, this week became a great microcosm for practicing McGonigal’s alternatives to attempting to suppress impulsive thoughts. For the last couple of days I’ve had mild, but noticeable, cravings for chocolate, particularly in the evening while watching TV. Instead of forcefully blocking out all traces of chocolate from my mind (or at least attempting to) I opted to leverage experiment 2 and accept the craving without acting on it. I noticed my desire for chocolate, thought about the taste, texture, and smell associated with eating chocolate. I then thought about my health-related goals and attempted to balance my desire for health with my desire for chocolate. Lastly, I honored that while I wanted to eat chocolate, I would choose not to act on that impulse. So far the process has worked and thoughts of chocolate do not dominate my life. It’s not forbidden, I’m simply making an alternate choice. This has been supported by some recommitment as well. We have no chocolate in the house so I would have to run out to buy some. With the combined higher cost and improved self-awareness, the chocolate becomes less desirable. Beyond food related challenges, material from chapter nine has helped me retain focus for my job hunting. Every time I thought had thoughts of “I shouldn’t” or “I won’t” do certain actions that hinder my job search, I worked to reimagine those thoughts from the context of “I will.” In particular when preparing for a phone interview I had the initial thought of “I won’t rush through my ideas,” and I turned it around into a challenge of “I will pause and explain myself clearly.” Through the interview it was much easier to focus on the behaviors I wanted, and I think this helped me put those desired behaviors into action. I think that through practice I will become aware of more opportunities where I can switch the focus of a willpower challenge. I am convinced that there are multiple opportunities that I’m missing each day. As with all things, my awareness of these opportunities should increase as the practice becomes integrated into my life. The concept of surfing the urge, or being present and aware through feelings of craving, reminded me very strongly of the Bene Gesserit litany against fear from Dune, in particular the second half: “I will face my fear / I will let it pass over me and through me. / And when it has gone past I will turn the inner eye to see its path. Where the fear has gone there will be nothing / Only I will remain.” It would be easy to replace each instance of the word “fear” with impulse or temptation or craving, and very closely approximate McGonigal’s entire thesis. I will not eat sugar. Sugar is the little-death that brings total obliteration. I will let it pass over me and through me. Willpower Project 9 of 11: Don’t Read This Chapter. The Limits of “I won’t” power. This is part nine of my willpower project tracking my progress through Kelly McGonigal’s The Willpower Instinct. Jump back to part one if you want to start at the beginning. Chapter 8 was all about the ways in which others impact our willpower. It’s somewhat ironic, therefore, that I spent more time alone last week than I usually do. My wife was out of town and we’d just moved, so I took the week as an opportunity to connect with myself, doing more reading and taking more time to be by myself than I typically have time for. I noticed that my willpower isn’t particularly higher when I’m alone, but it takes on a different flavor. My decision making is much less filtered by other concerns. In some ways this is positive because I was able to very independently flex my schedule to make time for additionally reading, but I also had less accountability to eat well because no one was looking over my shoulder and I felt a decreased sense of responsibility. This reduced sense of responsibility made it easier to let dishes pile up in the sink. The additional time spent alone also served to highlight the time I had that was influenced by others and my experiences definitely aligned with the concepts that McGonigal outlines. I am definitely more easily influenced by people I am close to. When my coworkers get off topic it is easy for my concentration to drift along with them, but if I’m writing in a coffee shop the conversations of strangers have almost zero impact on my ability to focus. I also noticed the social impacts while at the gym. The people surrounding me have an impact on how much time and focus I give to warming up. When people were warming up and stretching very intentionally I noticed that I was more diligent in my own warm-up, regardless of the posted workout that day. When people were less focused in their warm-up routine, my focus drifted as well and I warmed up less carefully as a result. Luckily this wasn’t associated with any injuries or difficulties this last week, but it is definitely something I will continue to be mindful of. Warming up intentionally is a nice bite-sized “I will” challenge. In terms of using visualization to leverage positive social impact I only had one experience where I did this intentionally: job hunting. Searching for a new job (across the country no less) has been a consistent “I will” challenge for me even though it hasn’t seen much attention in these posts. This last week, now that we’ve moved, I’ve been able to dedicate more time to finding a job and I’ve encountered some blocks that make me want to stop looking. In these moments I’ve worked hard to maintain my willpower, and this week I intentionally visualized how my wife would react positively as I applied to each possible position. This wasn’t the only technique that I leveraged, but it definitely helped me keep my long term goals in mind when things got difficult. Quick! Don’t think about purple elephants! It’s all you can think about now, right? That’s the essence of Chapter 9. When we work really hard to suppress thoughts, ideas, or emotions we can’t actually do it and we spend more time thinking about those things we’re trying to suppress. This is all well and good when it’s purple elephants, but it’s more difficult if you’re trying to suppress an impulsive thought. The paradox occurs because while one part of our brain (the operator) is working on thinking about everything that is non-purple-elephant, the monitor portion of our brain is running scans to make sure we’re not thinking thinking about those elephants. We get a series of signals along the links of “am I thinking about purple elephants? No? Ok, good. How about now?” It turns out that while we’re doing these checks we’re actually thinking about those elephants. The same goes true for that cake you’re trying to resist, or that pair of shoes you’re trying not to buy. If suppressing your impulsive thoughts doesn’t work, what do you do to avoid temptation? McGonigal’s answer to this dilemma mindful acceptance. There are some specific variations of mindfulness and non-attachment that help us deal with ideas that we want to suppress, but it can be boiled down to the idea that we should notice our feelings without judging them, and disconnect our thoughts from our actions. Just because you have the thought, doesn’t mean you have to take the action. This is really the entire essence of the book, and could summarize McGonigal’s entire definition of willpower. We have impulsive thoughts all the time, and our willpower is our ability to differentiate thought from action. I want to eat a lot of chocolate when I’m bummed out because sugar and fat trigger dopamine, but I use my willpower to make a different choice that is more in line with my long term goals. My midbrain activates one thought, and then my prefrontal cortex overrides that impulse with a rational command. I think one thing, and then I do another thing. Specifically for this week I’ll be focusing on one of the experiments from Chapter 9, and that is swapping our willpower challenge from an issue of “I won’t” to “I will.” An example of this would be turning the statement “I won’t eat refined sugar” to “I will eat foods X, Y, and Z.” The research on this shows that by framing our choices positively we build more confidence and more long term success. If we’re constantly thinking about what we can’t have we form very intense cravings that are difficult to ignore, and when we do give in to our cravings, we indulge to a greater extent. This has an educational component as well. Instructing a student to resist negative behaviors is less effective than encouraging them to replace the negative behavior with a positive one. Instead of “don’t blurt out in class” the correction should be “when you have something to say, raise your hand.” The student can focus their “I will” power in order to encourage positive behaviors, just like focusing on “I will eat more carrots” helps me avoid chocolate. This chapter is particularly helpful to me as, despite reading everything, I still tend to think about using my “I won’t” power as a first response. I look forward to seeing how switching to an “I will” focus changes my behavior. Willpower Project 8 of 11: INFECTED! How Willpower is Contagious. This is part 8 of my willpower project. If you’re just getting on board now, you may be interested in jumping back to part one to get the full picture. The story so far is that willpower is a conflict between your impulsive self and your planning self. You can grow your willpower so that more of your choices align with long term goals, thus making your life better. I won’t lie to y’all. This chapter is the first time I’ve been deeply skeptical of McGonigal’s work. Her premise is that willpower, and other behaviors, are contagious meaning that we can transfer behaviors from ourselves to others, and we can “catch” behaviors from other people. Willpower included. My brain rejected this pretty quickly, and even her first study (which cites that the best predictor of an Air Force Academy cadet’s fitness was the least fit cadet in his squad) had me highly incredulous. I mean seriously, how does one out of shape dude in a squad of Air Force Cadets cause the whole lot of them to lose fitness? Thank you Kelly McGonigal for consistently cited academic research! Throughout the chapter McGonigal won me over through her diligence in citing research to support all of her claims. (Take note writers. Evidence helps you convince people. Claims alone are insufficient.) My rational brain took the time to listen to evidence and win over my quick emotional rejection of the material. McGonigal also cites later in the chapter that this is a commonly rejected portion of her course because people hold strongly to the idea that through rugged individualism we can block out social pressures. The data does not bear that out. We’re incredibly susceptible to social influence, and it is often the only thing that works to change behavior. The experiments for this topic are extremely relevant even if I’m not a fan of McGonigal’s word choice. All three of the experiments this time are highly similar as each one applying visualization. Depending on the context it’s either visualization of a goal and its potential hurdles, a powerful role model, and those who might be proud when we succeed. Each one of these tries to intentionally leverage social influence in a positive way. None of these visualizations are particularly complex, and their purpose is clearly explained. What’s more interesting is how McGonigal presents mindfulness with respect to social influences. I’m very curious about who influences me, and how much. McGonigal claims (with evidence) that there are two important factors that influence how … influenced we are by someone else: the extent to which their behaviors align with our goals, and how connected we are with that person. This means that I should be highly influenced by people I care deeply about who also exhibit behaviors that align with my goals. When my wife exercises, this should positively impact me. When someone unknown to me smokes, this shouldn’t really impact me. I’m highly interested to see how much I can track the impact that others have on my willpower, and who has a high impact. And another two weeks have passed without a post. It turns out moving keeps one pretty busy, but we’ve sold the house, moved into the apartment, and schedules can be reestablished. The willpower project is back on track. I’ve tried to remain mindful of my willpower-based decisions throughout the moving process, however it became quite difficult as getting boxes packed and moved dominated my active willpower reserves, leaving little for healthy eating choices or exercise, let alone finding time to write. (Eating was particularly impacted as we were in kitchen limbo for a while with cooking supplies packed and no food in the house, causing me to eat out all meals except breakfast for about a week.) With those concerns in mind, I’m pretty happy with how I made out through the process. I was able to draw on willpower reserves to make sure that boxes got packed, and then subsequently unpacked. In addition to being mindful of my willpower decisions, I made my choices easier by leveraging the idea of reducing variability. I did this by intentionally limiting my options for lunch. I allowed myself to get either a salad from Whole Foods or chicken and stir-fried veggies from Uwajimaya (a local Asian grocery). Other possibilities were simply out of the question. I combined this with the idea of the green willpower fill-up (see chapter 2) because I can walk from my office to Uwajimaya in a reasonable amount of time and I took advantage of this when the weather was cooperative. This definitely helped me stay on track with my long term health goals, despite the stress of moving. In my professional life I was able to use McGonigal’s process for countering cycles of self-guilt. April and May are a stressful time in public education, particularly with teachers on non-continuing contracts as this is the time of year when they hear whether or not they will be retained. When things are looking unclear for my teachers many of them hyper-analyze their decisions and deeply internalize any failures, quickly progressing into a cycle of self-guilt and possible avoidance. McGonigal’s process outlined in chapter 6 allows me to help teachers see that they are not alone in their struggles and there are concrete actions they can take to increase the likelihood of being retained. This helps teachers take an active role in their retention and avoid feelings of helplessness. Wait 10 minutes is simply that. See a temptation? Wait 10 minutes and see if you still want it. If you do, knock yourself out. If not, don’t pick it. Lowering the discount rate is somewhat more complex and it is predicated on the idea that we are better at internally justifying the first reward we thinking about. This means that if you think about the immediate reward first you tend to think about the choice as losing the immediate reward. “I’ll lose the hour watching TV if I look for jobs.” We can lower the discount rate by switching the order of thinking by replacing the previous statement by saying “is it worth trading an opportunity to apply for my dream job for one hour of video games?” By switching the focus of our self-talk we can remind ourselves of our long term goal and take advantage of our brain’s method of internal justification. McGonigal uses the historical example of Hernàn Cortès burning his ships to illustrate the most extreme example of precommitment. It’s taking action that sabotages the impulsive self. In this case, by burning is ships, Cortès prevented the temptation of heading home before he’d achieved success. We don’t all have to burn our ships. There are more subtle ways to precommit to our long term goals. If you’re struggling with shopping, leave the credit card at home and take a specific amount of cash. If you’re trying to eat healthier, pack your lunch the night before so that it’s easier to grab it in the morning. If you’re trying to change your clothing choices, lay out the clothes the night before so that you don’t have to choose when you’re in a rush. All of these options are based in motivating oneself toward future goals by increasing the cost of choosing against the goals. In the first scenario, if you really want to use that credit card while you’re shopping you will have to head home and then back to the store, at which point you have significantly delayed the reward. Meeting your future self is intended to help concretize the future, something that McGonigal keeps coming back to. This was extensively covered in her talk that I attended, and I’ve been using this technique regularly with my teachers by having them write letters from their future selves or by vividly imagining a future transformative movement. These techniques have been incredibly helpful and I’ve seen my teachers build significant motivation toward improving their practice. I read this chapter about a week ago and I’ve been thinking about these ideas a lot. The small amount of willpower it takes to delay gratification by five to ten minutes is extremely powerful in helping me to making the choices that align with my long term goals. It doesn’t take much to reduce the discount rate and de-prioritize instant gratification. This chapter is a perfect example of how very small adjustments can make a big difference in a person’s life. These last couple weeks have continued to hinder my ability to write, and it’s difficult to get back in the habit. Travel and selling a house have both put a significant damper on my willpower and it’s been extremely easy to choose activities that take less sustained energy. The “what the hell effect” (see below) has definitely made it easy to put off writing this post, and as each day passes it’s easier to put it off one more day, and more difficult to sit down and return to writing. I’m back home, with no immediate travel plans, my work schedule is more normal, and I’m reestablishing my intent to finish off the book with weekly posts with a combination of self-compassion and an attempt to reduce the variability in my life. It’s been a heck of a week. Each day that I slipped past my self-imposed Monday deadline for these posts I found it a little bit easier to keep slipping the date. I told myself that I’d do it a little bit later, the next morning, then the next afternoon, and here we are at Thursday and I’m just sitting down to write. (Then revisions on Saturday and finally posting the following Monday.) However, in the spirit of self-compassion, I’m not going to beat myself up about slipping the date. I had an extraordinarily busy weekend that’s spilled into an extraordinarily busy week. As such I’ve had to prioritize other immediate needs over my desire to write. “I need” trumps “I want.” This variability in life was made as a rational decision, knowing that it would impact other aspects of my life. I am mindful of how these choices impacted my time for writing and I am moving forward without beating myself up about being late with the post. The chapter on moral licensing impacted me significantly and as a result I’ve been extremely aware of my impulse to trade “good” behaviors for “bad” behaviors. This came up in the idea of working hard and earning a reward as a result. As an example, last Saturday I spread roughly for cubic yards of crushed rock and then felt like I had a license to make uncharacteristically poor food choices in the form of eating a lot of chocolate. I knew that I was making the choice in the moment, and justified it through my hard work spreading the gravel. I’ve had more success in viewing decisions or actions as neither good nor bad. They are just decisions and they are either aligned with my long term goals, or they are not aligned. This helps me to make consistent decisions and prevents me from slipping into the idea of a moral bank account. When I make decisions I gain no credit towards vice, nor do I create some kind of moral debt when I indulge. I also watched a lot of other people engage in moral licensing. Particularly with food. Comments like “I had a salad yesterday” or “I’m going to the gym later today” were surprisingly common once I started to look for them. While drafting this post, in fact, I watched half a dozen people morally license a pastry purchase at a coffee shop leveraging both past and future “good” behavior to justify the indulgence. The second experiment, reducing variability in life, has been more difficult to maintain since I’ve have extremely uncommon events that are all occurring in rapid succession including selling our house, travel, and a wedding. I was not particularly effective at reducing diet variability, maintaining exercise, or my writing through the last week and a half. I was, however, able to be mindful of my choices and the degree to which they aligned with long term goals. I ate ice cream and tortillas mindfully and with full awareness of the impact. I hope to be able to reduce variability in the upcoming week as things settle down a bit. This chapter is all about dopamine. Before reading, I was under the impression that dopamine was released when we achieve a reward and promoted a sense of happiness for achieving our goal. In this chapter, McGonigal resituates dopamine as the chemical that helps us work toward a goal. In this case, when we want something, dopamine is released in anticipation of reward, sending a signal that we’ll be really happy once we attain the goal we’re working on. Essentially, dopamine spikes in anticipation of a goal thus motivating the hard work it takes to achieve said goal, then it backs off once the reward is achieved. McGonigal’s explanation made me think of dopamine as something of a gateway chemical, in that it can lead to other temptations. The spike of dopamine encourages us to follow impulse as opposed to reason in pursuit of new experiences. When we are presented with new experiences, new tastes, new ideas, our dopamine engages heavily in anticipation of a novel experience, promising our system that we will experience future pleasure. When those new experience don’t live up to our expectations we seek out additional new experiences in a attempt to fulfill dopamine’s promise that we’ll experience something great. This is easily manipulated by advertising that promises the new version of a product you already enjoy. When focused, dopamine is extremely positive. It is an essential motivator that helps us pursue goals and attain rewards. The challenge is that sometimes false rewards masquerade as meaningful. We regularly experience an overabundance of dopamine-triggering stimuli such as the smell of baked goods, sexually stimulating imagery, and that incredible sounds that alerts you of a new text or email. Each one contains that promise of some wonderful experience and so our brains pump dopamine, encouraging us to act on those impulses. The promise of immediate reward easily circumvents our rational ability to plan our actions and we find ourselves making impulsive choices before we’ve even thought about the consequences. I identify with this most with the experience of eating large quantities of food before I’ve even realized that I’m eating. Salty snacks are particularly dangerous for me as I can easily polish off an entire bag of chips or popcorn without even realizing that I’m eating. The willpower experiments for the week leverage both the beneficial and dangerous sides of dopamine. The first is to actively dopaminize an “I will” challenge by creating a strong image of the desired outcome. If you’re scared of flying, actively visualize the benefits of getting on the plane and your body will give you some dopamine, promising good feelings. The second experiment is to mindfully indulge and observe the extent to which the actual reward experience aligns with expectation. In particular the concept is to see if you need as much of a reward to get the desired feeling. Is it one piece of chocolate, or ten? One beer, or six? The hypothesis is that by being mindful, and fully experiencing the feeling of indulgence, we reach satiety much sooner than if we indulge without thinking. Additionally, mindful indulgence helps us understand if we’ve correctly aligned our rewards with our desires. Did you really want that doughnut, or would a small piece of chocolate have taken care of the feeling? We can only know this by being mindful. For myself, the mindful indulgence will likely come in the idea of taking a break. Taking a moment to put work aside and watch TV, play some video games, or read a couple comics is a strong indulgent behavior for me and I’ve definitely found myself becoming mindful and realizing that my short break turned into two hours of video games unexpectedly. Hopefully by being mindful of the experience I can enjoy taking a few minutes of a break, thus spending less time in break mode.